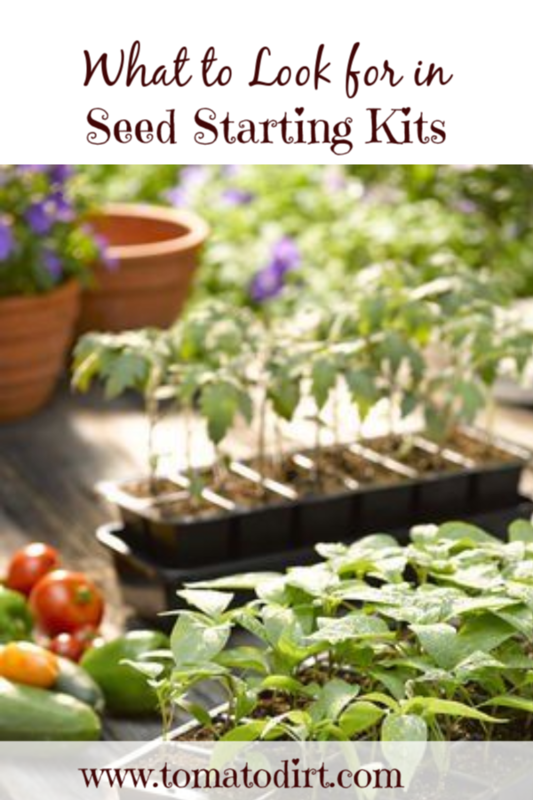 Seed starting kits offer an excellent value if you want to grow your own tomato plants from seeds. By purchasing a kit, you save money over the price of buying individual components. And kits are convenient. In one package, you get all you need to start tomato seeds. Beginners, in particular, are drawn to kits because using them makes starting tomato seeds much less intimidating. Seed starting kits come with trays that have different numbers of cells. You can choose a kit offering the number of cells that meets your needs. If you want to start only a few plants, buy a kit with a smaller number of cells. If you’re interested in growing large numbers of tomatoes, as do commercial growers, you can use 128-cell trays. And seed starting kits come with all different numbers of cells in between. Durability is another advantage. If you buy a quality kit to start with, you can re-use it each year when you start your tomato seeds. There are lots of kits out there. Consider two especially important features as you choose yours: the kit’s planting tray system and its cell size. 1. Planting tray system. The traditional kit offers a planting cell tray and a reservoir tray. The planting cell tray is made up of individual units, or cells, that will accommodate individual seedlings. Each cell has holes in the bottom for drainage. The planting tray is set inside a reservoir tray, which captures moisture that seeps through the holes after watering. Traditional seed cell trays are offered by a number of vendors. Newer kit styles offer a self-watering system. These prevent potting mix from drying out – a key factor in tomato seed starting success. Like traditional seed cell trays, self-watering systems have a cell tray and a reservoir tray. What makes them different is their self-watering system, set up to wick water from the reservoir tray up through the planting cells. Planting cells rest on a hydration mat (and in some cases, an additional pegboard) on top of the reservoir tray. The hydration mat’s edges sits in the tray's water, wicking up enough moisture to keep the seed starting mix damp. This allows the planting medium to stay moist for about five days. 2. Size. Tomatoes are fast-growing. They outgrow small planting cells quickly. It’s a good idea to use trays with the biggest cells possible. The larger the individual cell (2-4 inches in diameter), the more opportunity for each seedling to spread its root systems without having to be disturbed and re-potted. Seedlings grown in very large cells (3-4 inches wide) often do not need to be re-potted at all before being set out in the garden. Keep in mind that the larger the cell, the fewer cells a tray holds – meaning trays with large cells will accommodate fewer plants. 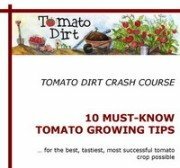 But starting tomato seedlings in 1- or 1 ½-inch cells is not a recipe for gardening disaster. Once seedlings have two sets of seedlings, they can be successfully re-potted to larger containers and can grow excellent root systems. When it comes cell depth, deeper is better, too. Deep cells encourage tomato roots to reach down into the water reservoir, whether it’s a traditional tray set up or a self-watering system. That means root systems grow stronger, which is always better for tomato seedlings. Planting medium. A sterile, soil-less growing medium prevents diseases and damping off. Use a sterile mix. Coconut coir, a natural fiber extracted from coconut husks, is quickly becoming a popular seed starting medium. The fibers allow for good root aeration. You can buy coco coir as a planting medium. Coir is also available in growing pellets, which reduce mess. Greenhouse cover. Some kits come with a clear plastic lid, which acts like a greenhouse cover. It holds in humidity during the early stages of germination and growing. The cover is a helpful option. It gives seeds the opportunity to germinate more quickly. Once seedlings grow large enough to touch the greenhouse lid, you can leave it off. Plant fertilizer. As tomato seedlings emerge, they don’t need extra nutrients because they’re getting nutrients from the seed itself. After about three weeks to a month, they can be fertilized with a reduced-concentration solution. An extra fertilizer packet that comes with a kit is a nice add-on, but it’s not a deal-maker when choosing a kit. Plant labels. Another “nice to have but not completely necessary feature.” You can choose from an assortment of labels. Heat mat. A heating pad placed underneath seed starting trays, as offered by Hydrofarm Germination Station, helps seeds germinate quicker. It’s helpful to use a seedling heat mat no matter what seed starting system you choose.